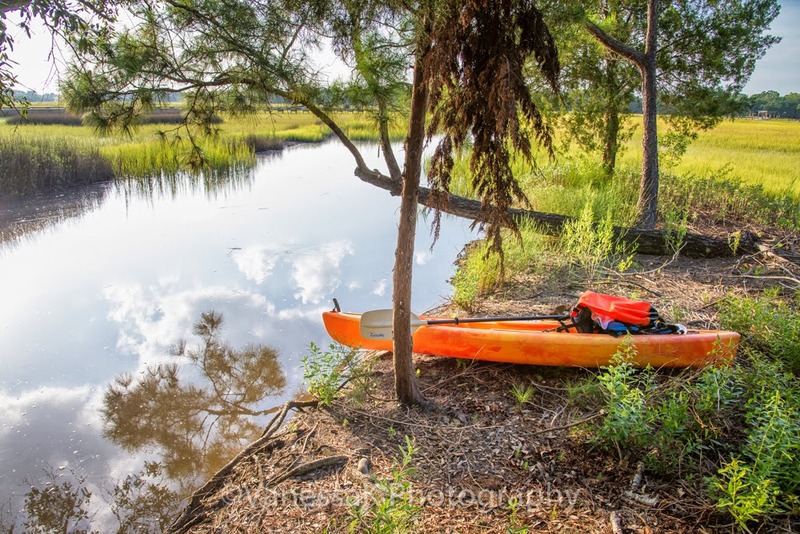 I have been experimenting with abstract photography and submitted the image below to a pop-up art show at the West Ashley Farmer’s Market sponsored by Fabulon and West Ashley Arts Initiative. 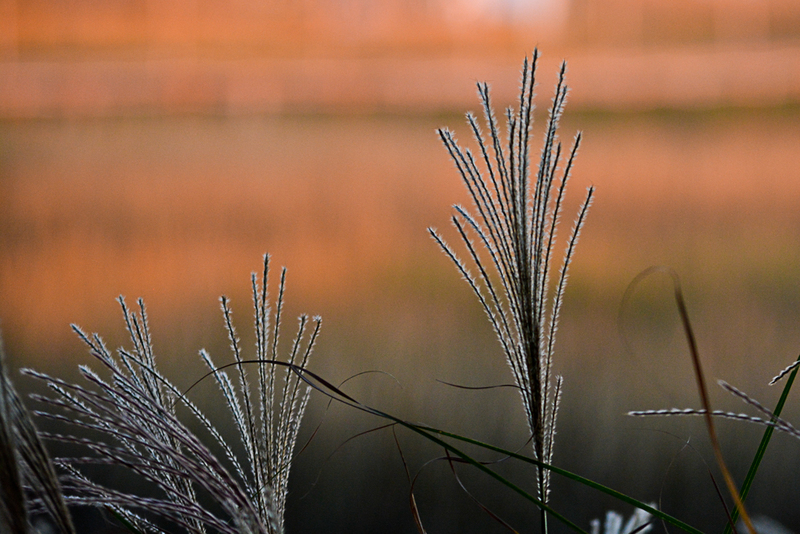 The photo was taken in the marsh behind my house. 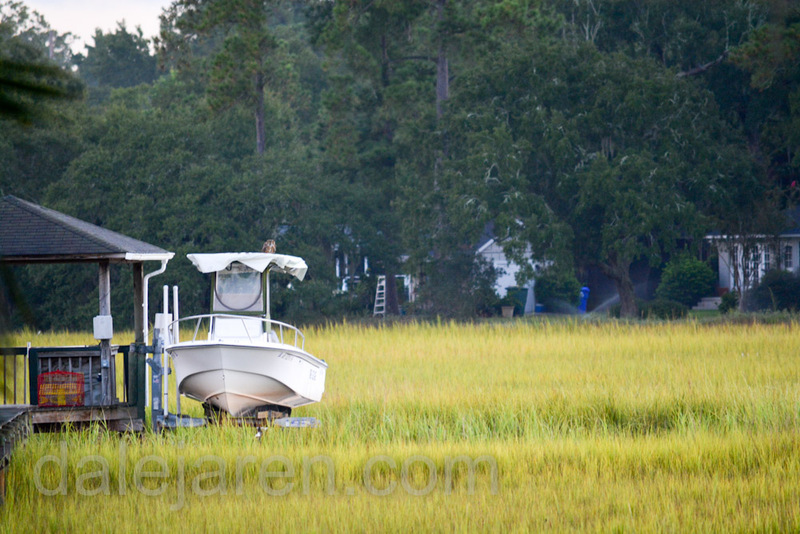 The golden color is spartina grass reflected mid tide in the salt marsh. The squiggly lines? Periwinkle Snails and Fiddler Crab tracks! No, not ‘our owl’. Since last year, Scott and I became volunteers at The Center for Birds of Prey. We are officially members of the Renesting Program. We are on call to renest birds of prey chicks that have fallen out of the nest. 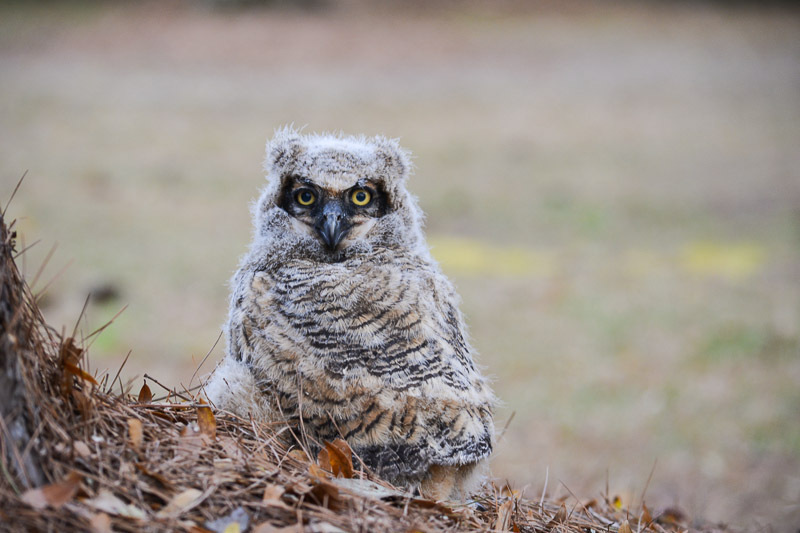 Great Horned Owls are the first of the nesting season for birds of prey. 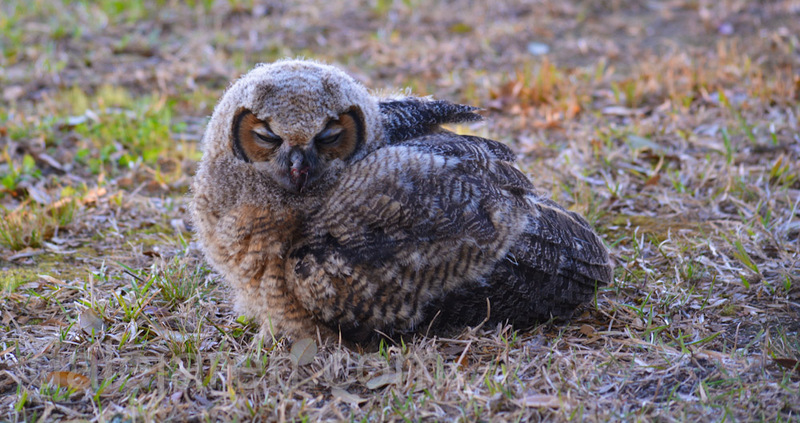 The Center got a call on Tuesday, March 17th, that there was a baby owl on the ground. And we got the call. Our first ‘mission’! I am embarrassed to tell you that I went to the reported area and could not find a chick anywhere! I look and look. No chick. I call Joe, the guy that reported it while walking his dog, to get an exact location. I am in the right place. No chick. An adult parent is clacking whenever I get close to a particular tree. Kind of like that old game of Hide the Button – getting warmer, no getting cool, colder. Adult clacking means I am close. No warning sounds mean I am really cold. 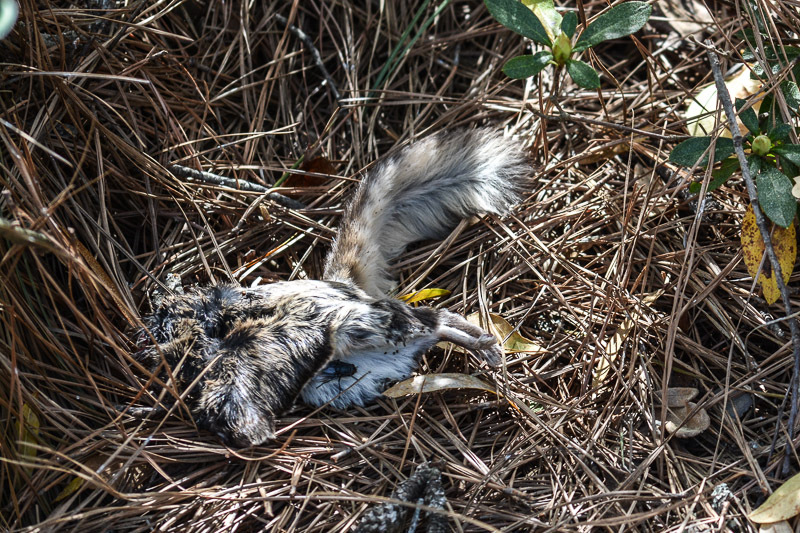 The area around the tree that elicits the most warning alerts from an adult owl is full of all kinds of interesting evidence: a headless baby squirrel, three adult squirrel tails, owl pellets and lots of white poop. But no chick. I listen. I am quiet. My first assignment and I cannot find the chick! I knock on doors. Explain. Leave notes on doors of ‘not at home’ nearby residents with my contact information. I go home defeated. Four hours later, Joe calls back. The chick is sitting out in the open, pretty much exactly where he told me he saw it that morning. By now, Scott is home and we gather our gear and head out. Joe has recruited a neighbor kid to stand watch until we get there. Sure enough. 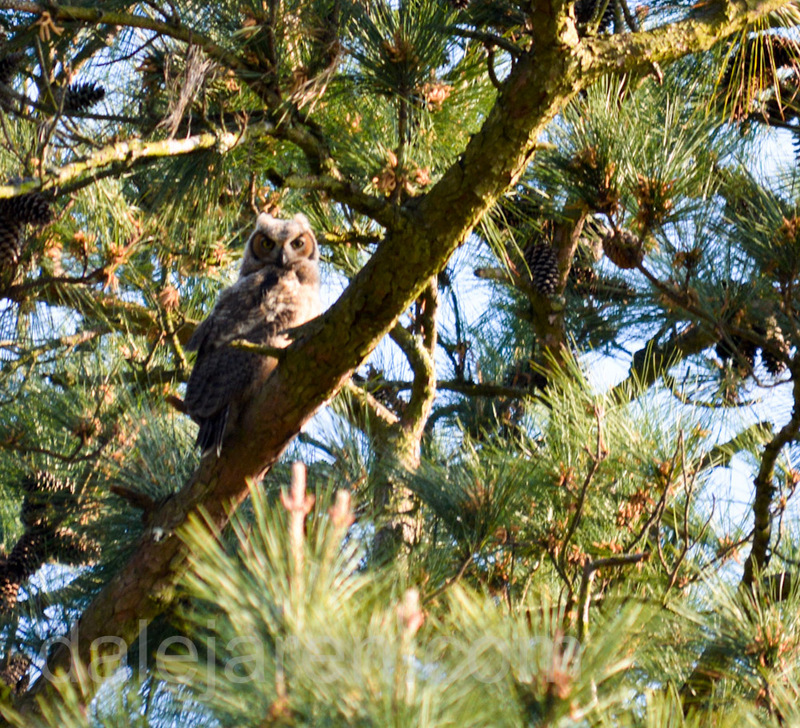 A Great Horned Owlet is just sitting there next to a pine tree, out in the open, in total and complete site! Scott and I confer. There is no visible nest. And this chick is developed beyond the nestling stage. It is a Brancher but not able to fly yet. I examine it as best as I know how. I hold its talons and unfold its wings, one at a time. All looks good. The chick is amazingly compliant. An adult owl is clacking its beak but from a safe distance. I am warning you: do not hurt my chick! 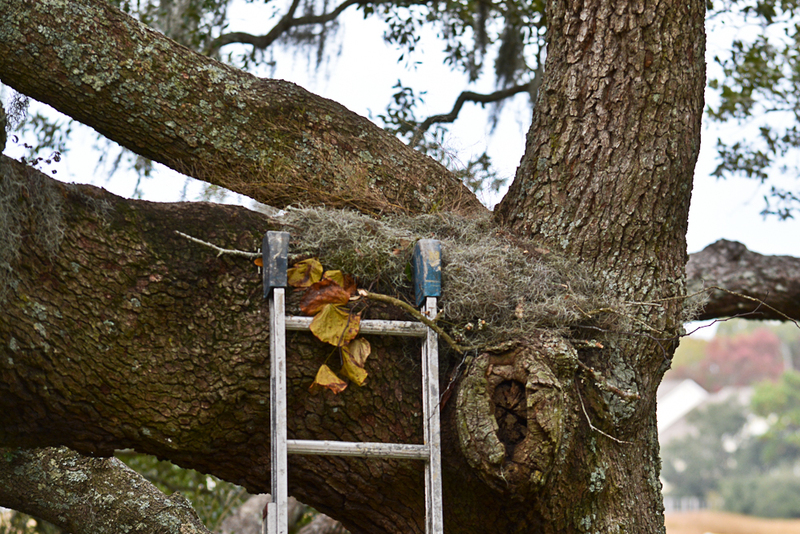 Scott and I decide to place it in a large Live Oak Tree. We get permission from the homeowner. 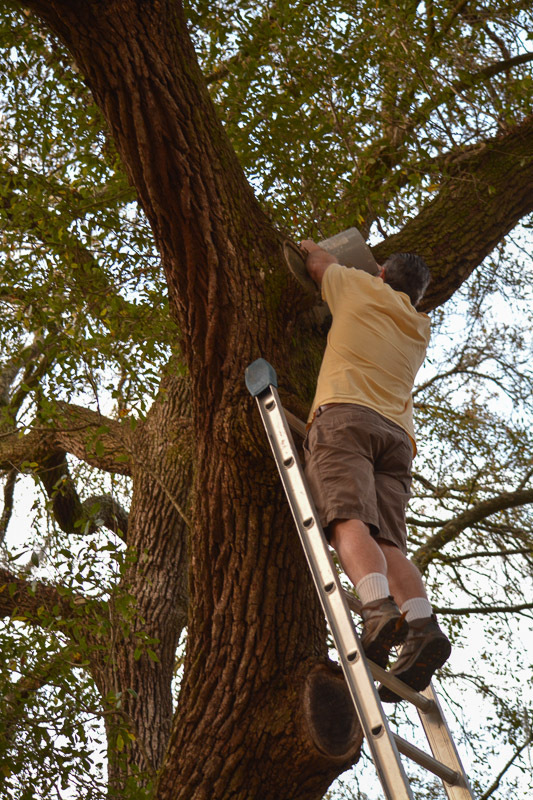 We put the chick in a bucket, Scott sets up the ladder to reach a crotch (or nook) in the tree, about 20 feet high. We discovered last year that a bucket was the most expedient and safest way to carry a chick up a ladder – for all involved. I explain to neighbors that have gathered to watch what and why we are doing this and also what to expect. And give everyone our contact information. What we expect: this will not be the one and only time we are in this location. We know from our experience from last year (with ‘our owls’) that this will most likely be the first time, not the last. Not too secure looking. As, ahem, now that we are ‘professional renesters’, we are not supposed to attribute human feelings or characteristics (anthropomorphism) to our feathered creatures. BUT clearly, this chick does not look too happy. We pack up our gear and watch from a distance with binoculars. Parent owl communicating with chick by hooting softly. Chick is silent. Looking a little more relaxed now. And safe. This is all we can do. As Joe texted when I gave him an update, “I would say that young owl had the luck of the Irish on its side today.” Indeed. But that is not the end of the story of our first mission. Followers of this blog from last year’s adventures will recognize that there is almost always another chapter. Stay tuned! Special thanks to Joe for his diligence in reporting this fallen chick and following up on its status to make sure it was safe and secure. And to the neighbors Rachel, Emily, Elizabeth and others for whom I do not have all their names. Thank you! Preview of next blog: Same location, different chick! There is a lot going on this fall in our garden and on the marsh. 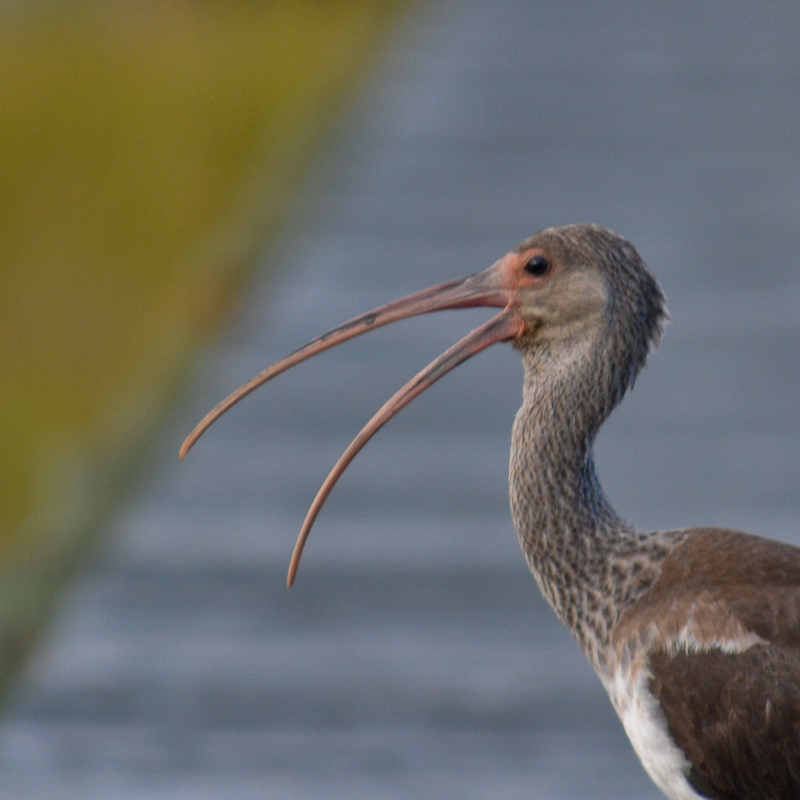 We have seen flocks of White Ibis grazing the marsh for fiddlers crabs. 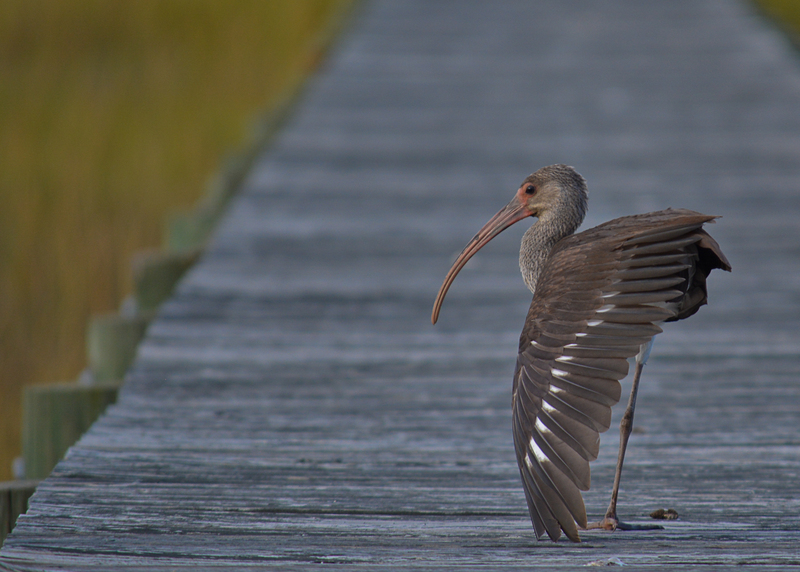 Below is a juvenile hanging out on our dock showing off its beak and wing feathers. 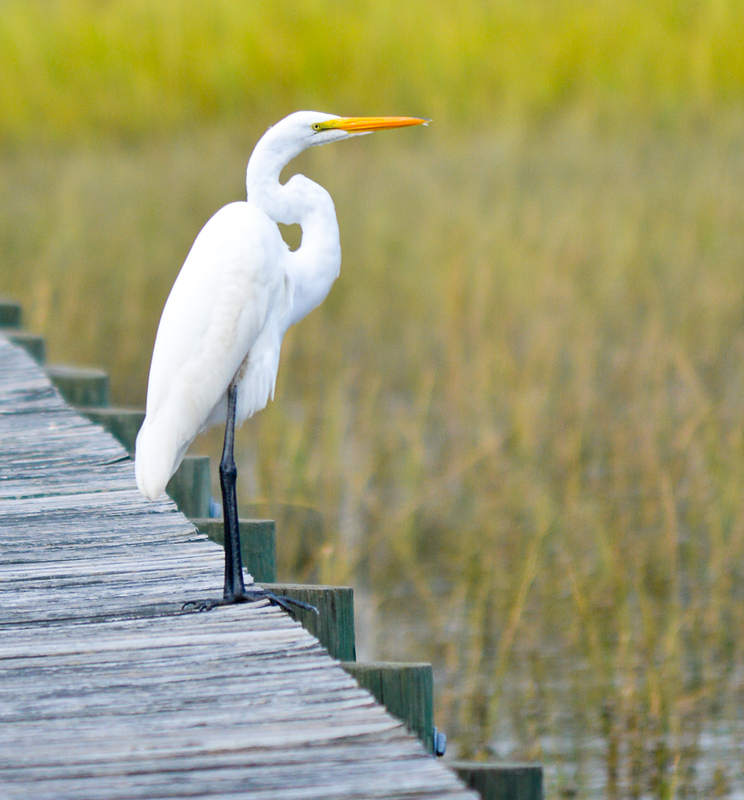 Another frequent guest is this Great Egret. 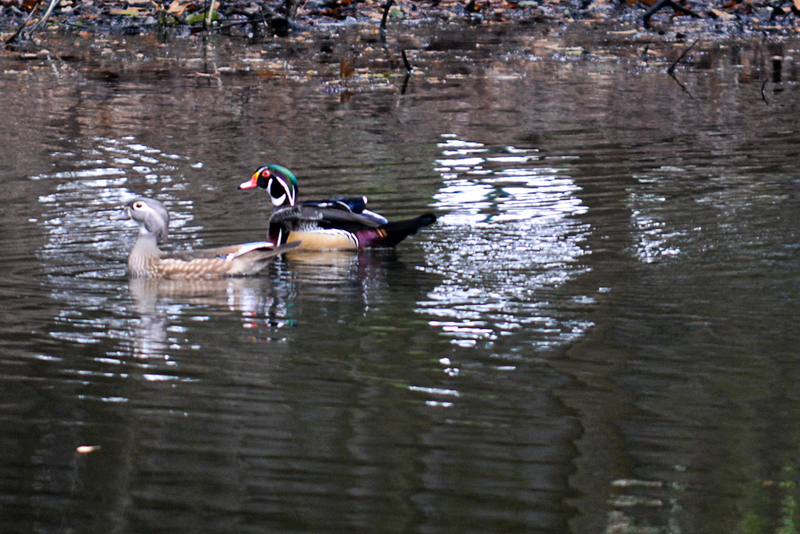 Several pairs of Wood Ducks have been vacationing in our neighbor’s pond. They are very skittish if I venture too close and immediately fly off returning only after I have left the scene. Therefore the photo is not great. I have to keep practicing to get the right settings on my camera to catch the fast shots. And it is not all about birds. We have hundreds (literally!) 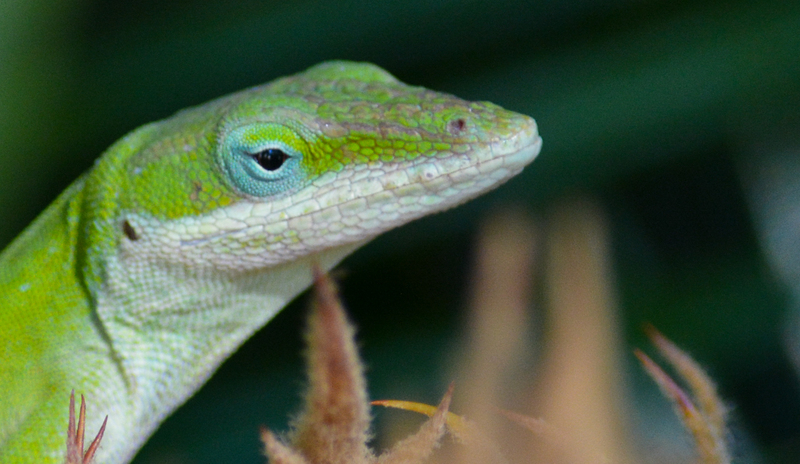 of these wonderful, insect eating Carolina anole lizards. They are great posers! Oh yeah, what about the owls? Well – we hear them. Almost every night. There is a lot of hooting going on and it is decidedly different from when they are on the hunt (wink, wink). We very rarely see them. We often hear them in the trees in the back garden and they are close together. 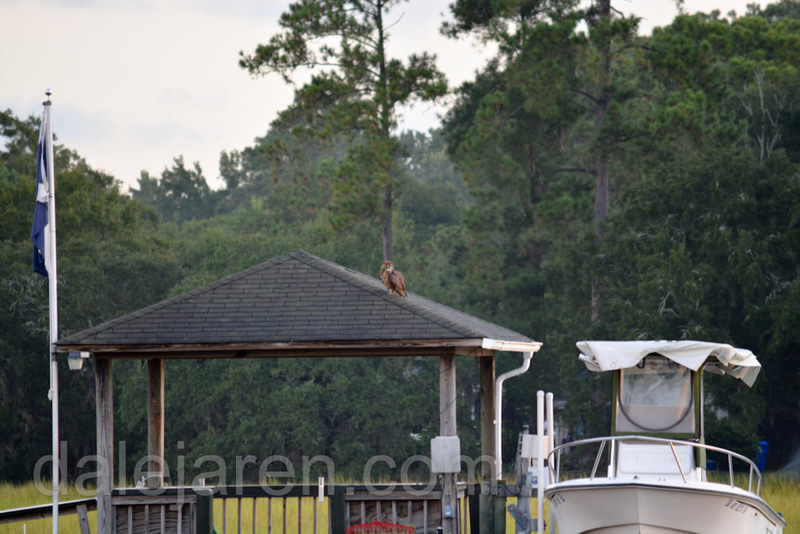 Once in a while I catch site of one on the roof of our dock in the early dawn. And we continue to find dinner remains on our t-top. We are fully expecting them to nest near us again this year. We have been scouting out all the abandoned squirrels nest and tree hollows so we will know where to look when they nest. 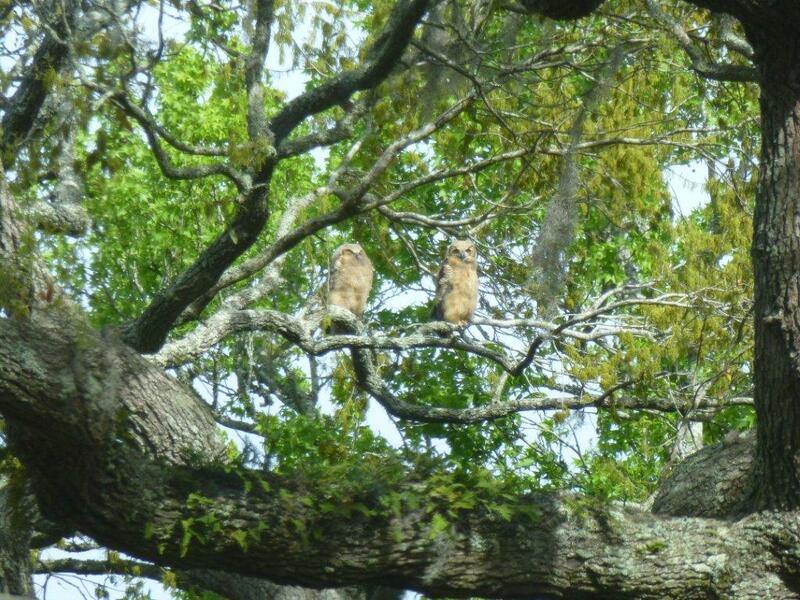 We are brushing up on our knowledge of Great Horned Owl mating rituals. And we volunteered with the Center for Birds of Prey as re-nesters. More about that in another post. Yes, I collected buckets of Spanish Moss and small twigs to fortify the Nook. I even decorated with fall leaves, feathers and dried grasses! 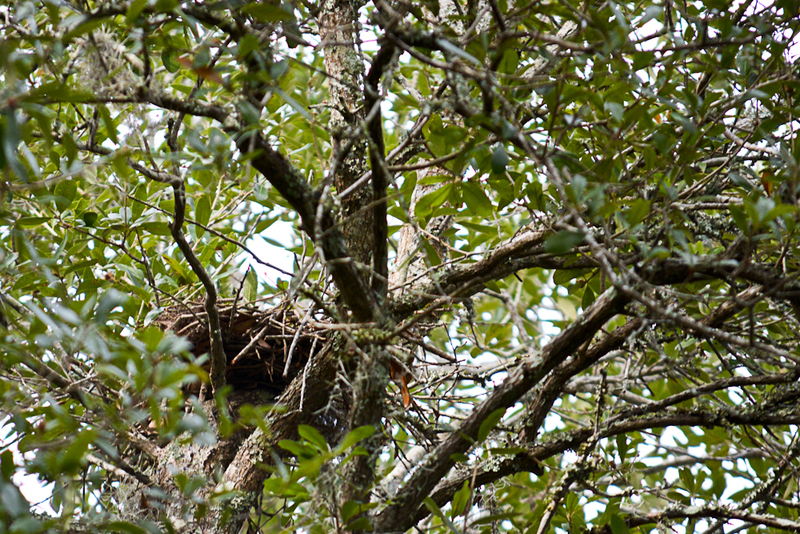 I think mine looks much sturdier than that old rickety squirrels’ nest. Seriously. 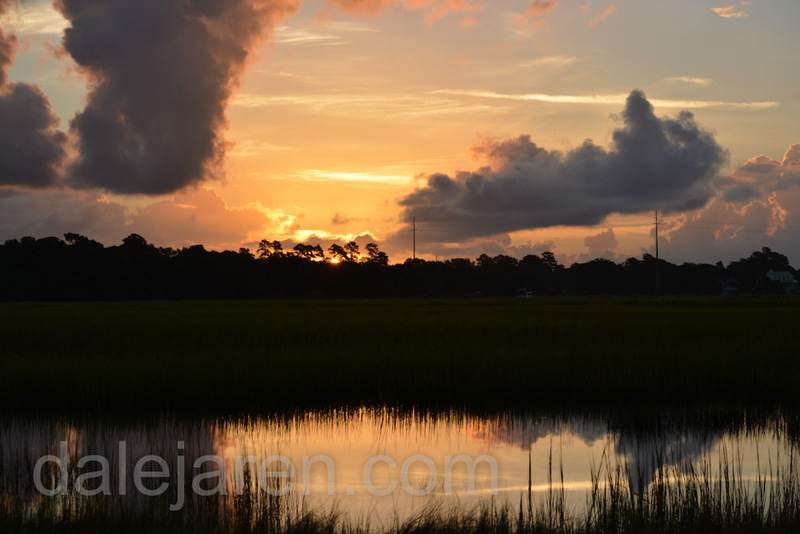 I took this shot of sunrise on the marsh a few days ago. 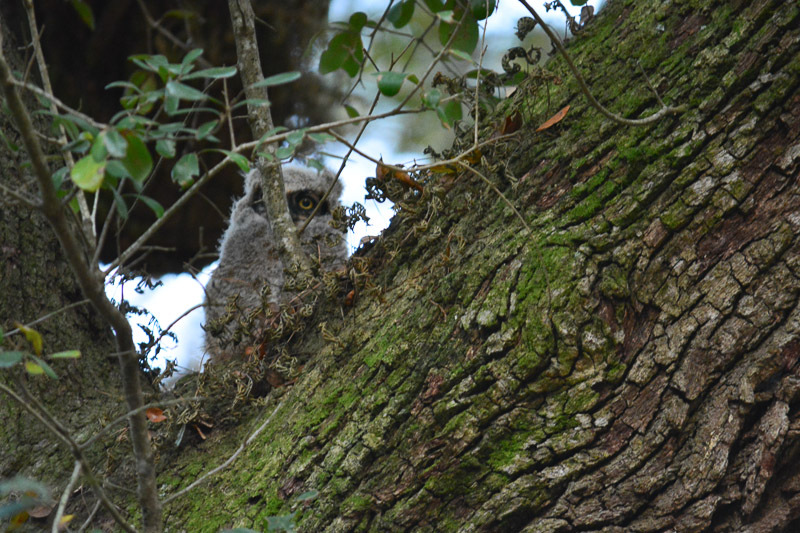 All summer we have heard and seen the owls hunting – both parents and one juvenile (previously known as the owlet Happy Feet). 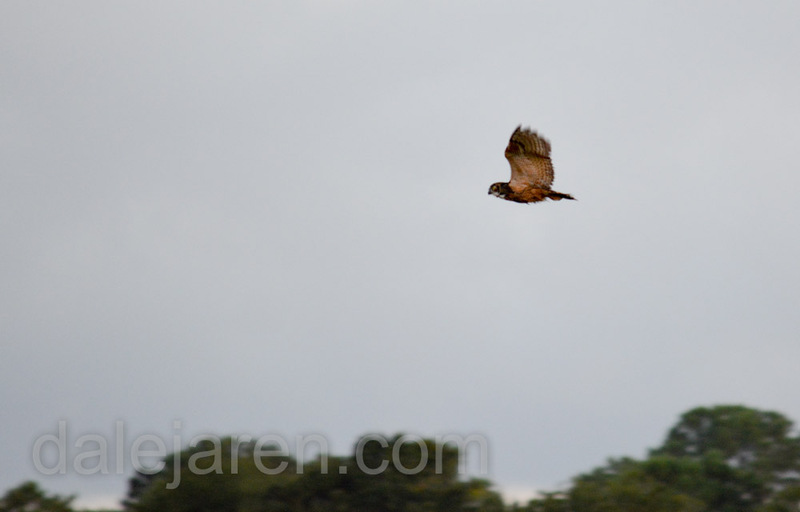 It is always too dark to photograph them at dusk and dawn when they are actively hunting. The parents still provide prey to the youngster. This we have deducted from their behavior as we watch and listen. 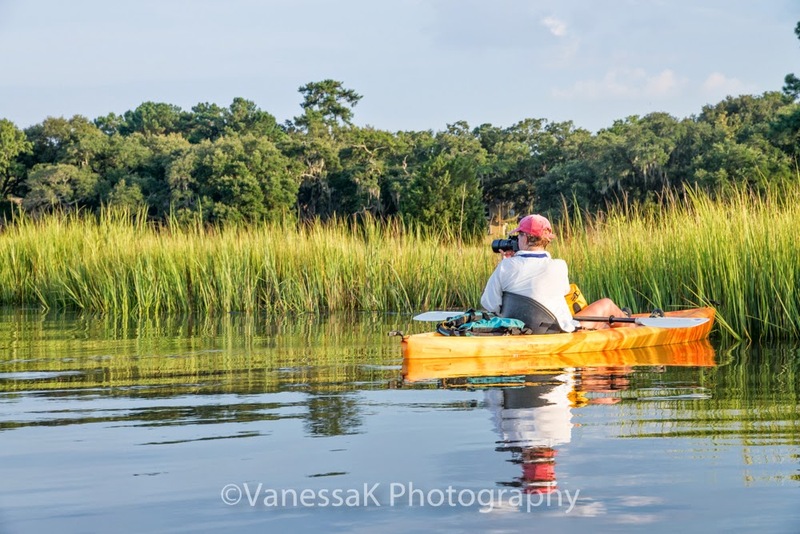 A few weeks ago, Vanessa and I kayaked at high tide (for access) over to the The ISLAND and walked around with our cameras during the day when the owls are roosting. There is heavy undergrowth on The ISLAND and the pine trees are very tall. 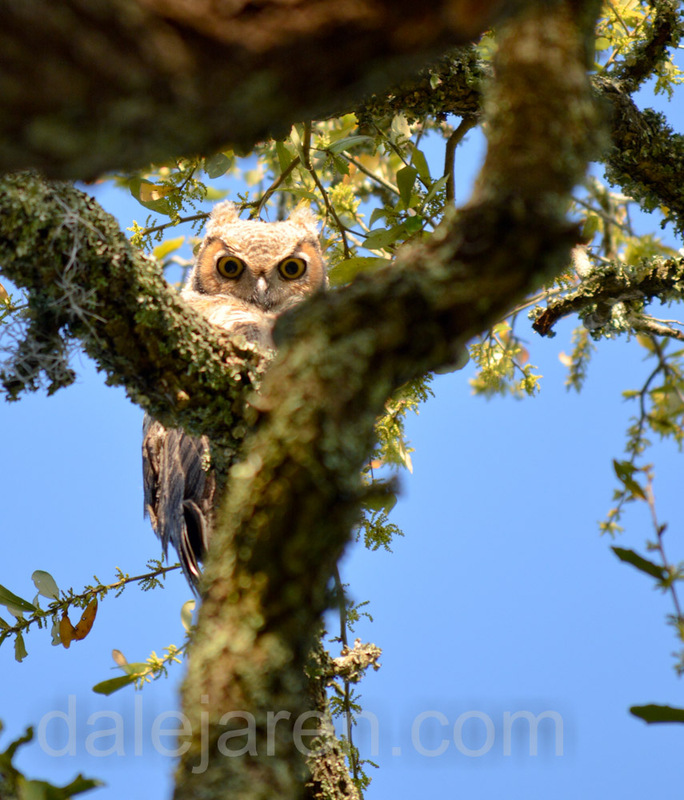 We spotted the juvenile owl from our kayaks on the approach to The ISLAND by way of a narrow creeklet that surrounds the high ground. 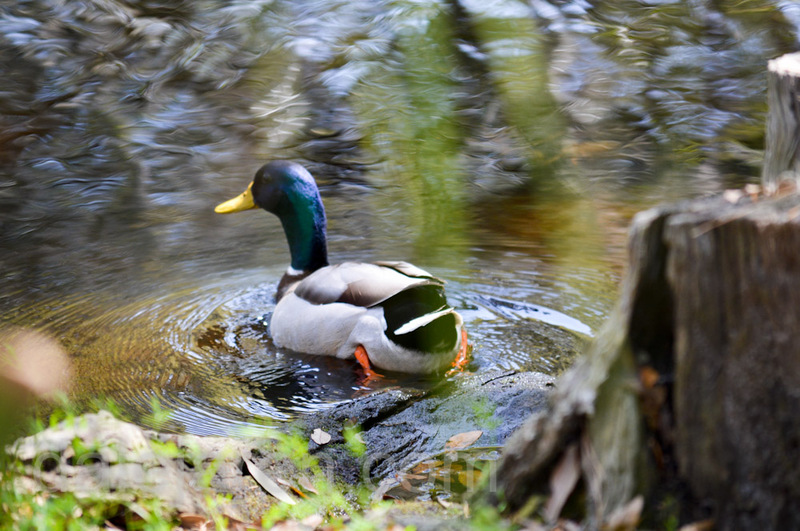 Yes, the same creeklet that was the scene of several owlet rescues from near drowning. See earlier posts. 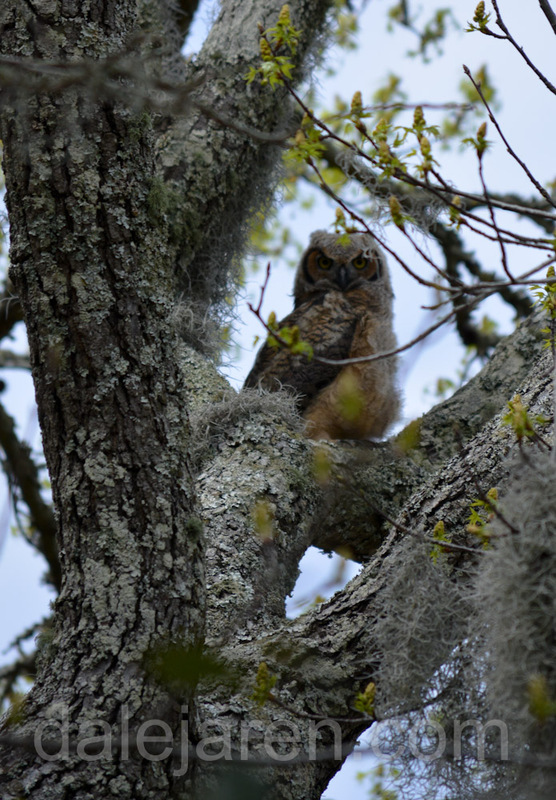 We observed the young owl in the same tree that I have seen it in while kayaking sans camera. It seems to be its favorite spot. In the feature photo at the top of this post you can see why sometimes they are hard to spot, especially at low light. Both parents and their teenager hang out on The ISLAND most of the day. Happy Feet is almost all grown up with adult feathers and distinguishing ‘ear’ feathers. But it still relies on Mom & Dad for food. Just like a teenager! BTW I asked HF whatever happened to MiniMe and he had no comment. There is always a parent in close proximity. They are very difficult to spot from distance or from the ground looking up into the tall pines. We think this is Dad. Almost every morning, if I am up early enough with the binoculars trained on the t-top of our boat, I can see and hear the young adult calling for its breakfast. And then a parent flies in and delivers a small rodent or bird. It is too far away to get a clear photo. Attempts to get closer result in a fly away. I guess it is about time I invested in a tripod and learned how to use the wireless remote! And buy a bigger lens! Please note that our t-top still has two layers of recycled bill board tarp that Scott and I made to protect our canvas from owl talons and beaks. So attractive! And this is the view as I turn back to the house. Dawn breaking. Unfortunately, we still do not know. We hear the owls hunting at dawn and dusk. 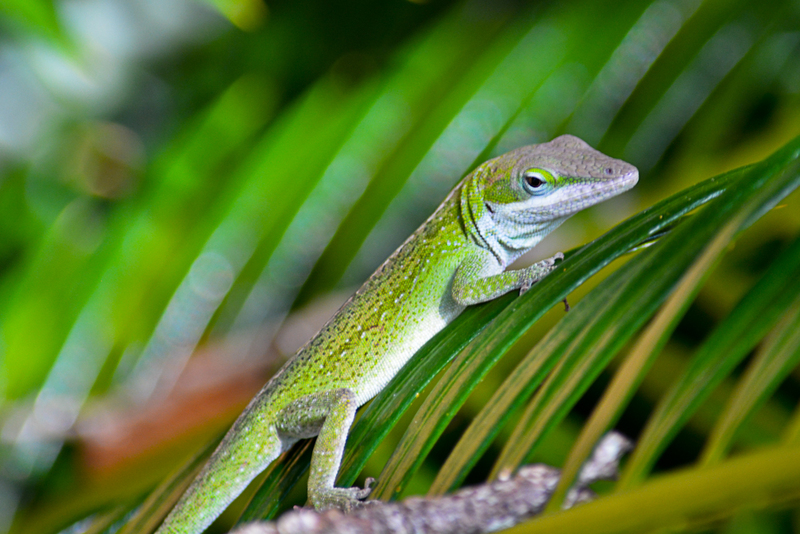 They have been spotted on the docks, in the trees and on The ISLAND. We cannot determine if there are one or two owlets. I’m not sure the term ‘owlet’ is appropriate anymore. Juvenile may be a more accurate term at this stage of development. Over the past several weeks, no one has seen two juveniles at the same time. Only one. It is full grown but still has enough fluffy baby feathers to see it is a youngster. The ‘horn’ feathers are more defined now. The Twins were very entertaining all summer last year. They were almost always together, side by side. The parents continued to bring them prey, sometimes live prey, until October when they started hunting on their own. 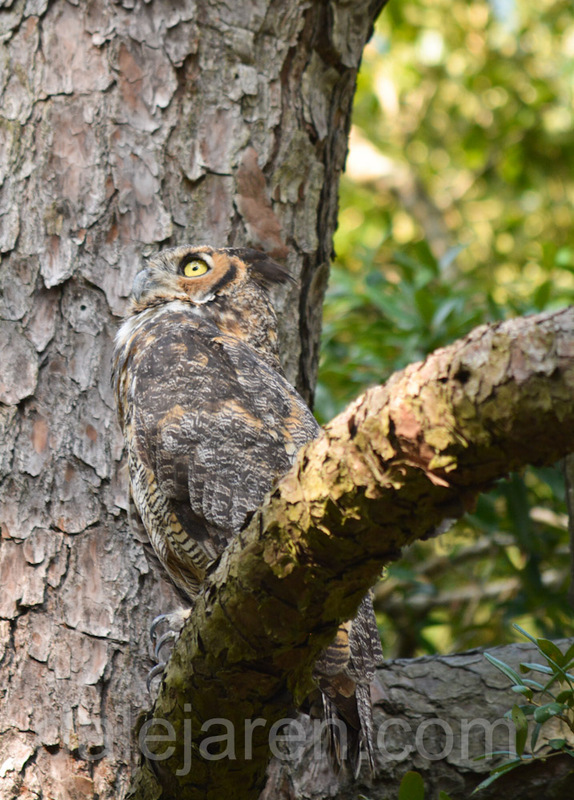 We never knew where they had nested and none of our neighbors had spotted them prior to their appearance in the Live Oaks along the marsh in our garden and adjacent properties. The Center for Birds of Prey folks told us that it was most probable that the parents are the same. 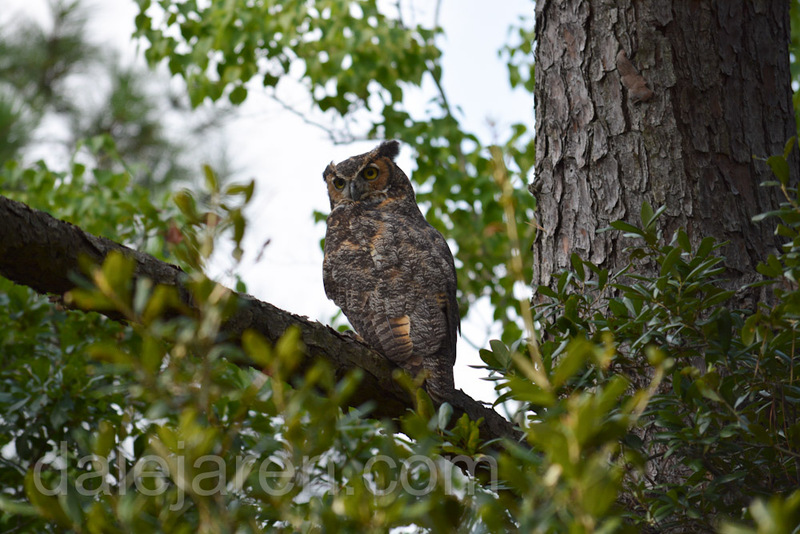 Great Horned owls mate for life and stay in the same territory if it provides an ample food source. 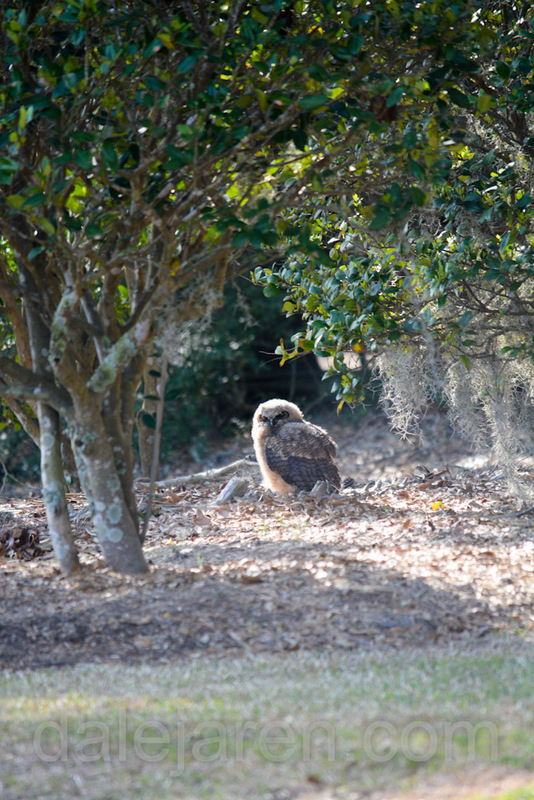 As the juveniles learn to hunt on their own, and as the nesting season approaches in late fall, the juveniles leave to find mates and establish their own territories. We have wondered how they do that – OwlDating.com or OwlCupid.com? Last year all four owls used our boat t-top as a dining table which shredded the canvas. We tried just about everything to thwart them. It is a long story in itself. I need to gather those photos for another post. 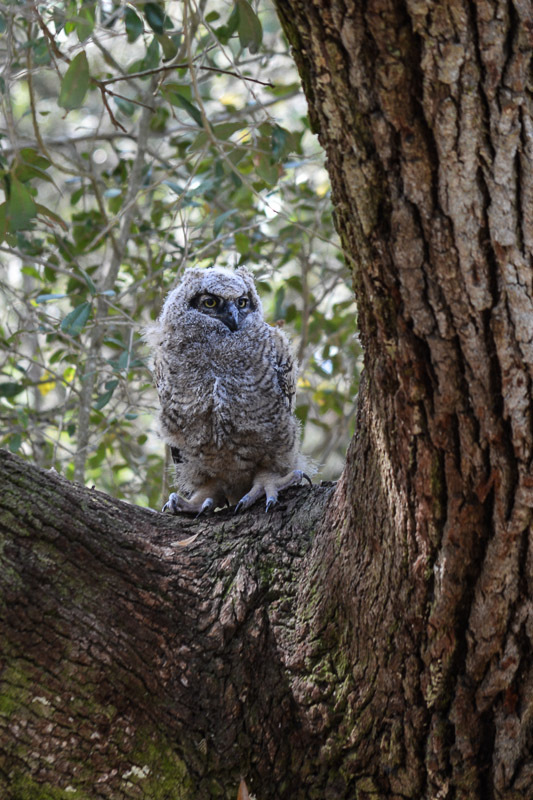 In the meantime we will keep watching and listening: One owlet? Or two? MiniMe is still missing in action (MIA). 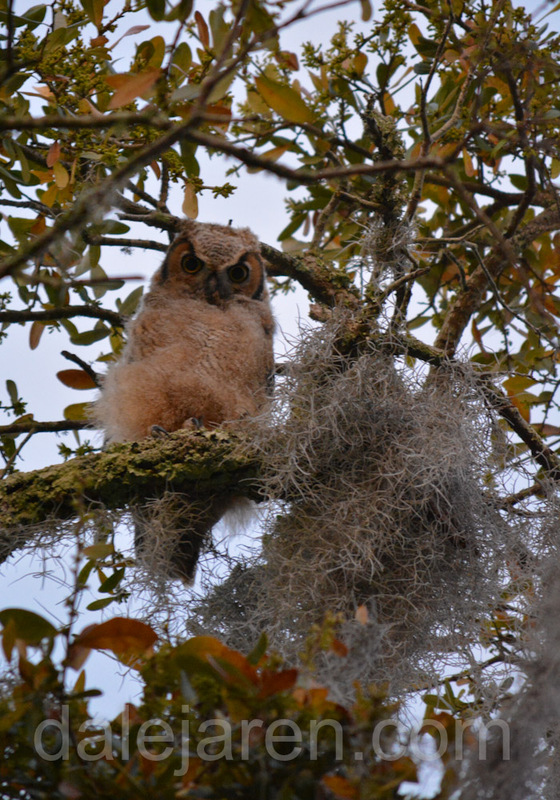 The photo above is the other bigger owlet (we think). Also know as Klingon, Twinkle Toes, Happy Feet and Big Foot. We have been trying to find MiniMe. We look and listen. One owlet or two? 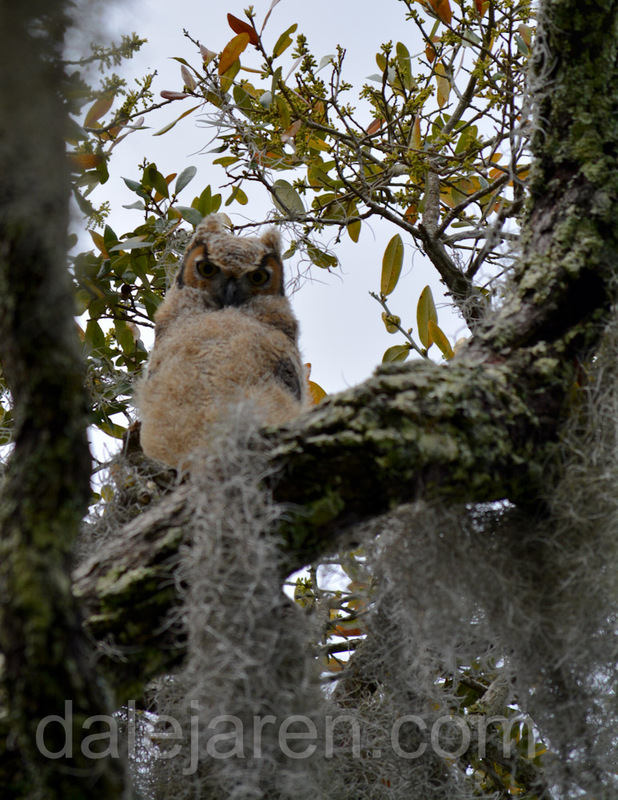 By we, I mean all of us that live on the marsh in the parent owl’s territory. We call and text each other what we see and hear. We also join up in our gardens, docks and marsh with binoculars and flashlights. Sometimes we convince ourselves that we do hear two owlet voices. But we cannot confirm. We have not found any evidence that MiniMe is permanently gone. Until we see two owlets at the same time in different places, MiniMe’s status is MIA. We have hope that Mm survives and is dancing in the treetops. Finally learning how to climb and fly. 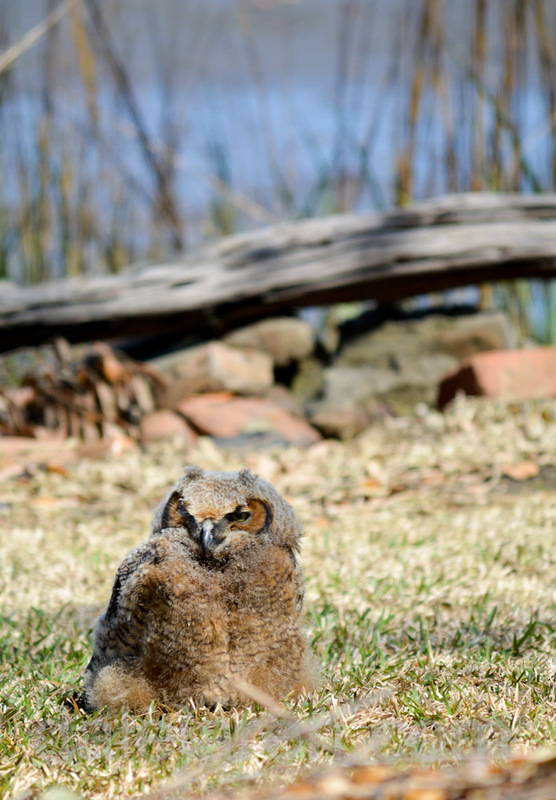 In the meantime, we celebrate that one owlet is thriving. These photos were taken on April 1st. 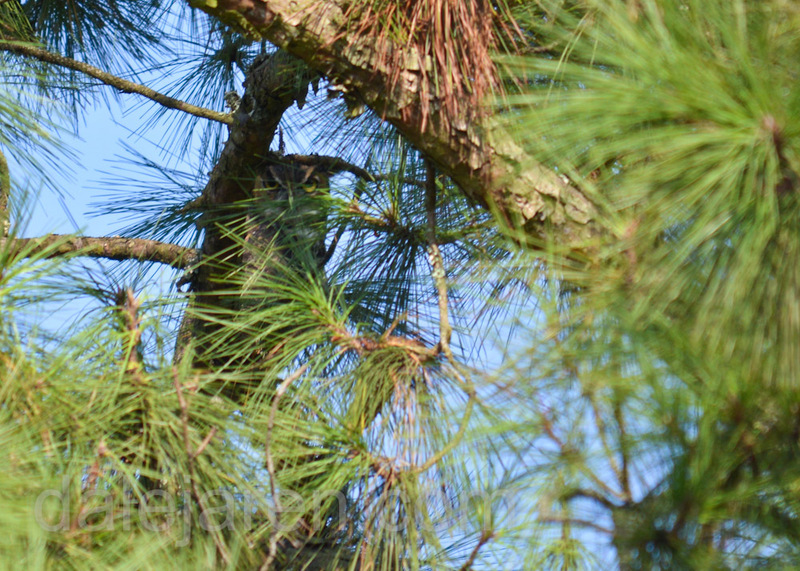 The owlet is in the very top of tall pines in front of our home. It looks good. Many fans of the owlets and especially MiniMe, with all its travails, have written and called to find out if there is any news. And also to check on us, worried that we are despondent. Scott and I are fine. We are secure in that we did whatever we could to help these magical creatures along in their life’s journeys. But we are also realists. And huge fans of mother nature. Yesterday, our neighbors reported a wild turkey in the marsh! I did see it but was not stealthy enough to get a photo before it flushed. A female or juvenile, and wild, since it flew. While trying to get a photo of the turkey, I spotted an easier subject. So life goes on. 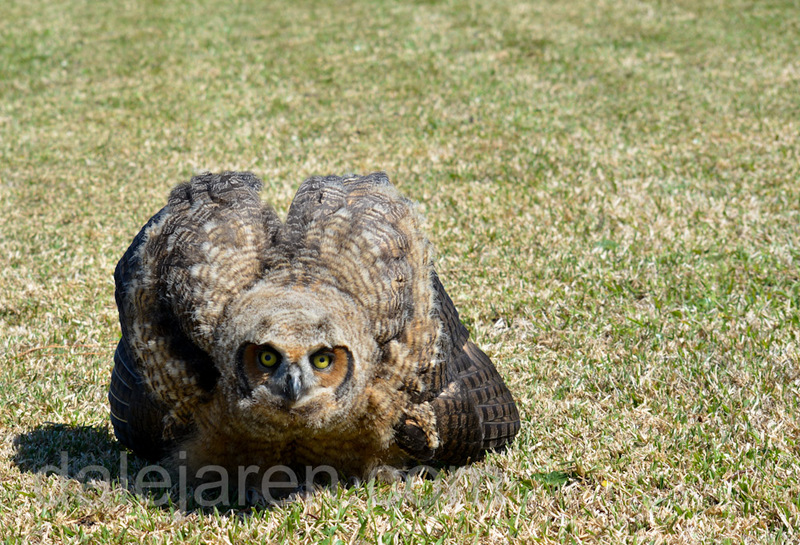 I will continue to update this blog with photos of the Great Horned Owlet. 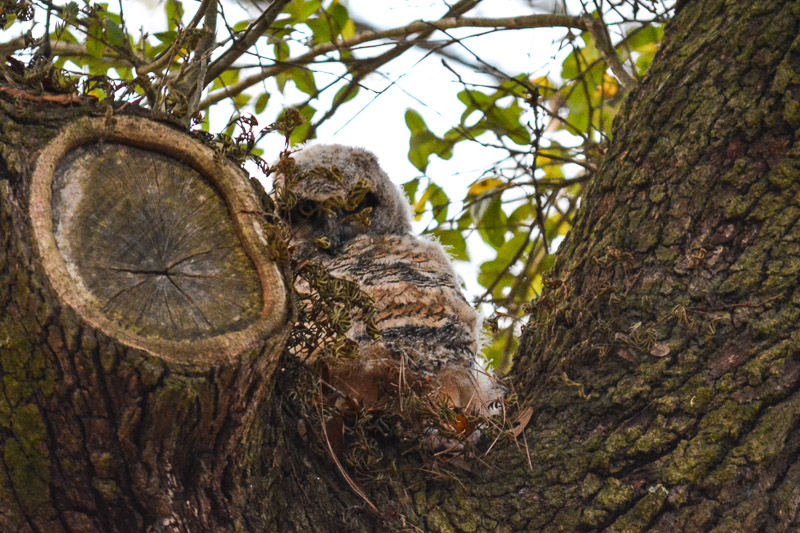 Maybe not considered an owlet anymore – a juvenile? I will have to look that up. Teenager? 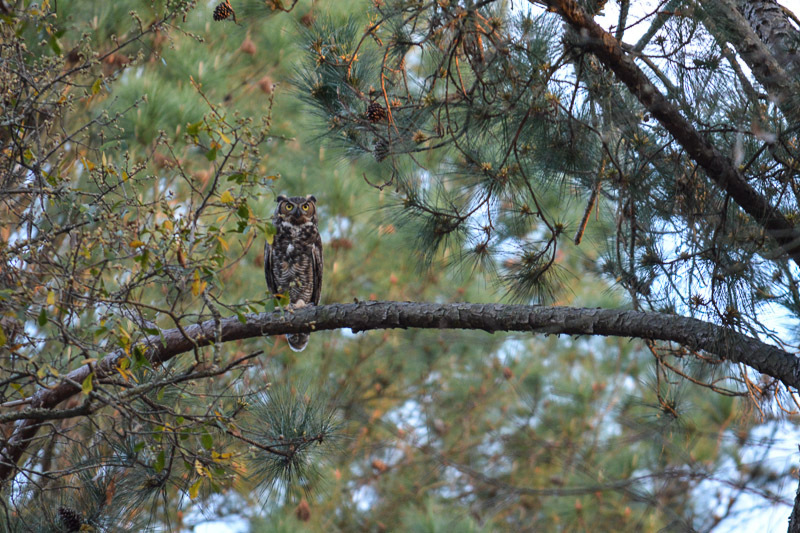 Last year about this same time, we had juvenile Great Horned Owls show up in our garden. We called them the ‘Twins’. 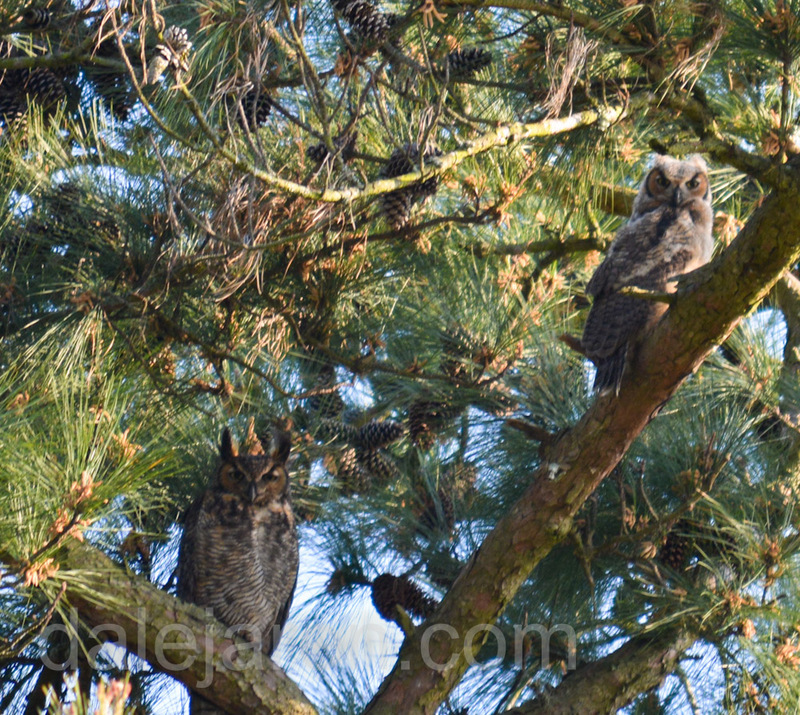 They were the size of the owlet we have now in our area. They sat side by side, everyday, quiet and well behaved. Until feeding time. They entertained us all summer long, the parents feeding them until late September. So we do have some experience, however last year, they did not appear as nestlings or even owlets. They were almost full size and still downy. And they could fly from tree to tree and were never on the ground. They could not hunt for themselves and the parents brought them live prey, once a huge snake. So we expect that we will be following and reporting on whatever the owls are doing for quite a while. Thank you for all your comments, support and concern – for the owlets, MiniMe and me! And St. Scott. And if we ever find MiniMe we will be sure to post it immediately!